Botox® is the trade name of Botulinum Toxin Type A, a purified toxin produced by the bacterium Clostridium botulinum, which is used in the treatment of multiple medical conditions. Botox Cosmetic, used for cosmetic purposes, is injected in extremely small doses directly into the specific muscles that cause frown lines. These isolated muscles no longer receive the signal from the neuron and relax. The action of frowning is stopped and frown lines diminish. The result of this treatment begins to appear in three to ten days. The treated muscles will gradually regain their action over a three to five month period. 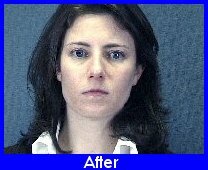 When the frown lines start to reappear, a repeat treatment is all that is necessary to maintain the desired result. When combined with other esthetic treatments one can achieve a refreshed youthful appearance with no time away from work or activities. Chemical Peeling is a technique used to rejuvenate and improve the appearance of the skin. In this treatment, a chemical solution is applied to the skin, which causes the surface layers of the skin to eventually peel off. The new, regenerated skin is smoother and less wrinkled than the old skin. However, the new skin is also temporarily more sensitive to the sun. Chemical peeling is often used to treat fine lines under the eyes and around the mouth. Fine lines caused by sun damage, aging, and hereditary factors can often be reduced or even eliminated with this procedure, however, sags, bulges, and more severe wrinkles do not respond well to peeling and may require other types of cosmetic procedures. Mild scarring and certain types of acne can also be treated with chemical peels. In addition, pigmentation of the skin in the form of sun spots, brown spots, freckles, splotching due to taking birth control pills, and skin that is dull in texture and color may be treated. Areas of sun damage, precancerous keratosis, or scaling patches may improve after chemical peeling. Following treatment, new lesions or patches are less likely to appear. During the consultation your skin will be evaluated, as to the most appropriate treatment and pre-treatment protocol will be discussed and customized to your needs. Prior to a chemical peel the skin is thoroughly cleansed with an agent that removes excess oils. After the acid is applied the patient will experience a warm sensation, which lasts about five to ten minutes, followed by a tingling sensation. Depending upon the type of peel, a reaction similar to a sunburn occurs following the treatment. After superficial and light peels, make-up can be applied immediately. Medium-depth and deeper peels may result in mild swelling and longer healing times. FotoFacial Intense Pulsed Light (IPL) treatments are an alternative to chemical peeling of the skin. A modern minimally invasive approach to skin rejuvenation offering benefits that are consistent and an incredible change in the skins appearance will be visible. Photo damaged skin is more than just wrinkles. It is a picture of hyperpigmentation: brown and red spots, skin laxity, enlarged pores, fine lines and wrinkles, and telangiectasias (veins). All can be improved with Intense Pulsed Light Treatments. 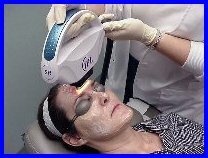 FotoFacial can decrease broken capillaries; fade brown and red spots and freckles. Discoloration associated with Rosacea can be reduced. 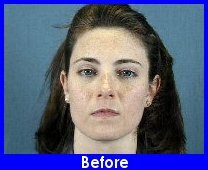 FotoFacial Intense Pulsed Light skin rejuvenation can be done after facial cosmetic surgery to improve and enhance long term results, by minimizing fine lines and wrinkles, erasing sun damage, facial veins, and clarifying irregularities in pigment improving the color and texture of the skin. FotoFacial treatments are performed under a topical anesthesia to optimize comfort. Prior to the treatment, a cooling gel is applied to the skin. Then using a spectrum of IPL appropriate to ones skin type, light energy ("flash lamp") delivers a series of gentle pulses to the skin non-invasively. The targeted area responds as the "pulsed light" fragments melanin (skin color pigmentation), which is then absorbed without damage to the surrounding area, delivering sequential rejuvenation to the skin. Individual treatment times vary, depending on the area being treated, and are delivered with minimal discomfort. FotoFacial treatments may also be combined with Microdermabrasion to further enhance results. Nd: Yag Laser is often incorporated to "soften" facial lines, treat facial veins, large blood vessels (acne Rosacea), mild acne scarring, and unsightly veins on the legs (laser sclerotherapy). During the consultation, the physician and our staff will collectively advise you on the pretreatment protocol that is tailored to your skin type and the combination of treatments that will best help you achieve your desired results. Microdermabrasion is used for the treatment of aging skin, mild acne, and minor skin abnormalities. Microdermabrasion is the placement and vacuuming of fine crystals across the skin, removing dead and damaged skin cells, creating a polished regeneration of the epidermal cell structure. Microdermabrasion is often combined with a light chemical peel or FotoFacial Intense Pulsed Light (IPL) to enhance one's results. Dr. Gilmore and our staff will advise you on the pretreatment protocol most suitable for your particular skin condition. Microdermabrasion is usually performed in a series of six treatments, although some patients may require additional treatments to achieve the optimum results. The real benefit after the series of treatments is that your complexion is smoother, softer, brighter, and has a "polished look". AlloDerm is normal human tissue, donated to US tissue banks in much the same way that other transplantable organs are. It provides the collagen structure and proteins beneath the skin. Nasal reconstruction and correction of dermal atrophy or tissue deterioration are optional uses for AlloDerm. 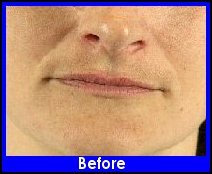 AlloDerm is also used to increase fullness of the upper and lower lips, which decrease with age. AlloDerm offers patients longer lasting results than most temporary dermal fillers. This procedure uses homograft (skin origin) tissue strategically inserted via small incisions to enhance the soft tissue areas of the mouth. Once in place, it fills in the missing tissue and eventually is integrated into your own. 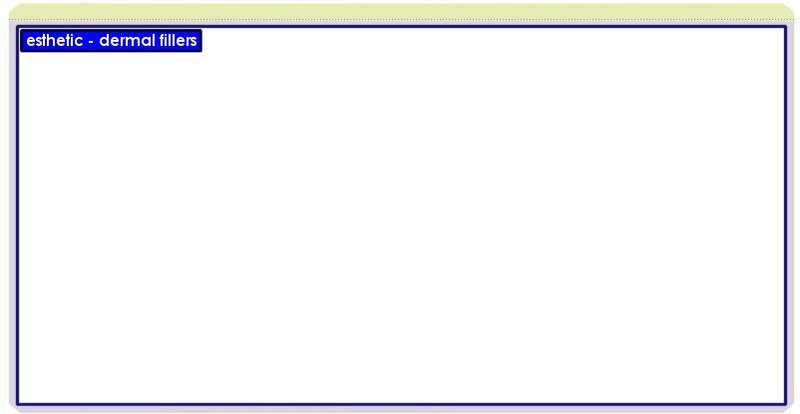 The implant site may have some sutures (stitches). You can expect some swelling, and maybe even bruising, at the implant site that is normal after surgery. Your treatment site may be a little firm during the healing process, but it will feel more natural as healing progresses. Collagen is a natural protein that provides structural support. It is found throughout the body - in skin, muscles, tendons, and bones. Collagen provides texture, resiliency, and shape in the skin. Over time, this collagen cushion wears down and lines appear in various areas. When injecting Collagen Replacement Therapy directly into areas where the body's own collagen has weakened, depressions can be raised to the level of the surrounding skin. It is most often injected into the lips, nasolabial folds (lines from the outer corner of the nose down), and mandibulolabial folds (lines from the corner of the mouth down). The Collagen injection itself is a non-surgical procedure. If treated with bovine collagen, one must have a skin test requiring a 30-day wait period. A small amount injected into the forearm determines if any allergic reaction might occur. During this 30-day wait period, the patient will monitor any unusual responses, such as swelling, redness, or hardening of the injected Collagen. After an uneventful wait period, the purified Collagen can be injected just below the surface of the skin with a needle where the body readily accepts it as its own. Newly released Human Collagen requires no prior skin testing, offering one immediate treatment and results. As with the body's own natural collagen, wearing down does occur with both bovine and human derived collagen. Therefore, periodic treatments must be done to continue with the desired effect, in most cases, on an average of three to four month intervals. Other dermal fillers are pending FDA approval, and permanent implants are another option, offering one long lasting results with high patient satisfaction and reliability. Restylane® is a natural cosmetic dermal filler that offers instant and long lasting wrinkle correction. Restylane®, recently approved by the FDA, is a safe and natural cosmetic dermal filler that restores volume and fullness to the skin to correct moderate facial wrinkles and folds. Restylane® is the first and only cosmetic dermal filler made of non-animal-based hyaluronic acid. Hyaluronic acid is a natural substance that already exists in the human body and is used to provide volume and fullness to the skin. The hyaluronic acid in Restylane® is a crystal-clear gel called NASHA™ or Non-Animal Stabilized Hyaluronic Acid. NASHA™ is biodegradable and completely biocompatible with human hyaluronic acid. Restylane® requires no pretesting, but you should take a few precautions before being treated. Avoid using aspirin, non-steroidal anti-inflammatory medications, herbs, or high doses of Vitamin E supplements prior to treatment. These may increase bruising or bleeding at the injection site. Also, if you have previously suffered from facial cold sores, there is a risk that the needle punctures could contribute to another recurrence. Restylane® has been used safely by Doctors worldwide since 1996. The most commonly reported side effects were temporary redness and swelling at the injection site. These effects typically resolve within two to three days. Restylane® studies have shown that the average treatment results last six months or even longer. The unique NASHA® technology helps maintain the cosmetic effect until the injected material is nearly gone. Treatments are typically scheduled twice a year. Evidence shows that having a touch-up treatment before the product has fully dissipated will enhance the lasting effects. Restylane® is injected directly into the skin in tiny amounts by an ultrafine needle, resulting in minimal discomfort. The procedure is simple and convenient, and results are practically instantaneous. 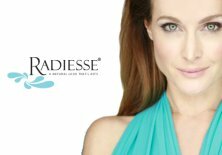 Restylane® is a customized procedure based on your specific needs, so the cost will vary from patient to patient. The U.S. Food and Drug Administration (FDA) has granted market approval for Captique Injectable gel -- a new dermal filler product based on Genzyme's non-animal stabilized hyaluronic acid (HA) technology. The way your skin looks is directly related to the way your skin is supported. As we age, the natural support layers in the skin break down resulting in the formation of wrinkles. Captique, a clear gel containing a purified form of hyaluronic acid, adds volume lost during the aging process by temporarily smoothing out facial lines and wrinkles. Captique is injected just under the skin's surface in order to temporarily correct wrinkles. 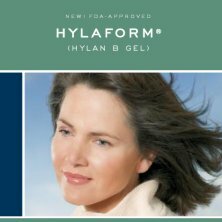 Hylaform® gel is injected just below the surface of the skin, filling in unwanted lines and wrinkles. It can be used to fill in smile lines around the nose and mouth, small lines above the mouth, frown lines between the eyes, and to minimize deep creases on the corners of the mouth.